Madden NFL 2001 is an American football video game. 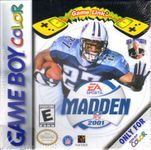 It is the third in the series to include an NFL player (the first was Madden NFL 99 which featured Garrison Hearst on the cover of the PAL version), Tennessee Titans running back Eddie George, on its cover. Also, an added feature, Madden Cards allows players to perform certain actions during gameplay. The Madden 2001 game had the ability to Create a play, Create a player, run a franchise, and collect player cards which would alter the game (having 5th downs, having only 3rd downs for the computer). Source: Wikipedia, "http://en.wikipedia.org/wiki/Madden_NFL_2001," available under the CC-BY-SA License.